Meet Brumby. She’s a Gathered skirt from Megan Nielsen patterns. The Brumby skirt has amazing deep scoop pockets, an exposed zipper and contoured waistband. Honestly I am an absolute sucker for a skirt with pockets. Can’t get enough of it. 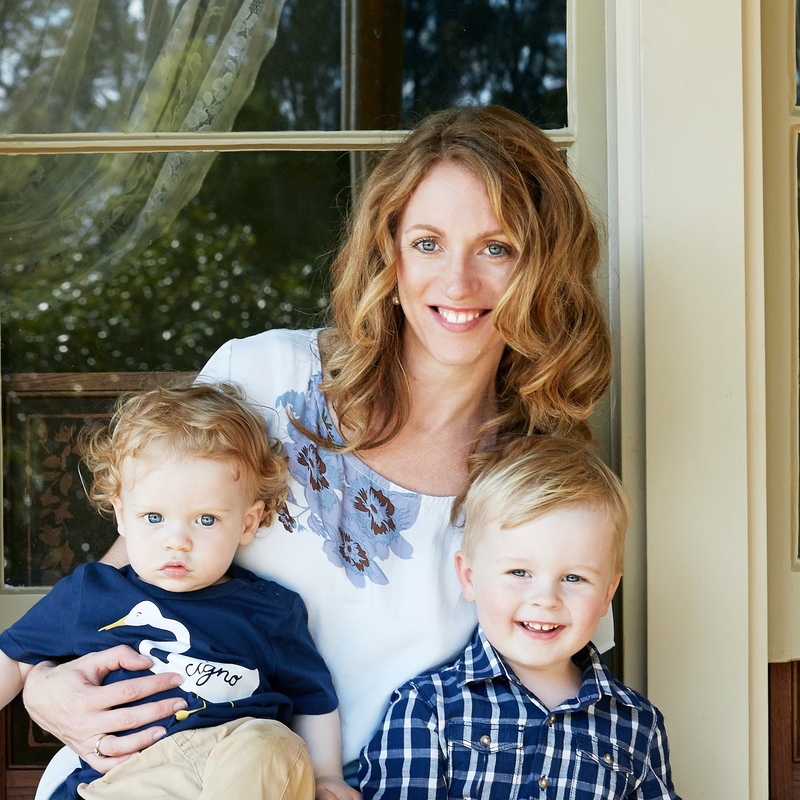 The Brumby Skirt has three different versions. I made version 1 in a medium weight denim from Spotlight. Version 2 is midi length, with pockets and additional fullness. I can see a floral version 2 in my future, but best not get too far ahead of myself. Version 3 is basic knee length gathered skirt. I must admit that I’d almost been stalking the Brumby skirt. I was very excited for her release. 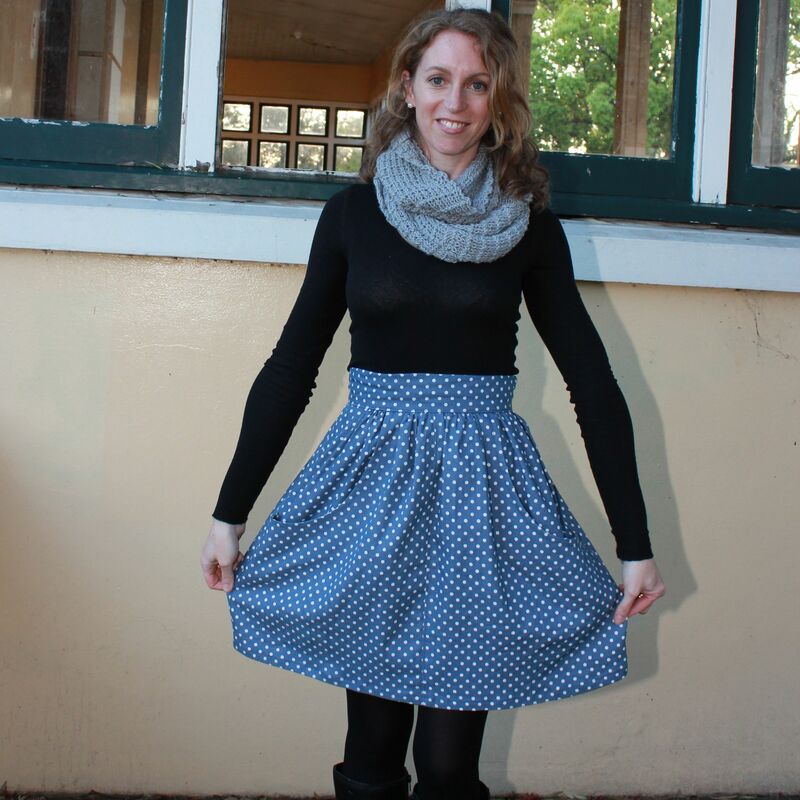 I snapped up the paper pattern and had grand plans of making a cute winter skirt. The thing is, my sewing is hampered by (a) lack of time and (b) my novice skills! It took me months to actually find the time to make the skirt. Once I started though, the Brumby skirt was a dream sew. One of those sewing projects were everything went smoothly and came together without a hitch. 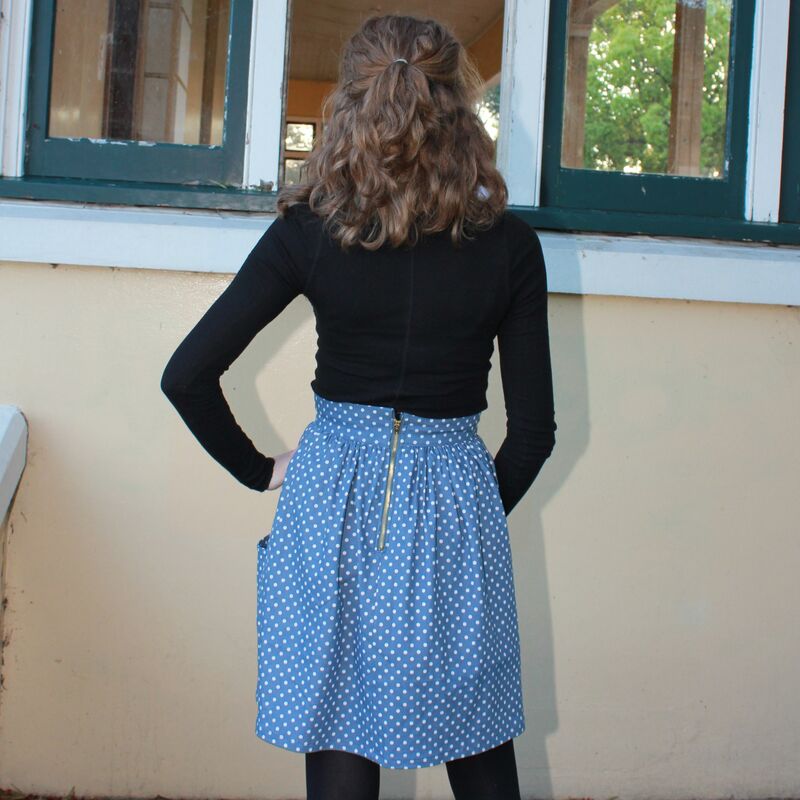 The Brumby skirt was a perfect sew for me, not too tricky but enough flare in the pattern to keep things interesting. The biggest challenge was the exposed zip. The instructions are clear and uncomplicated. The challenge was my zip was 20cm, slightly shorter than the required 22cm. I made some adjustments but still got it slightly off. As a result my zipper doesn’t quite reach the top of the skirt’s waist band. Nothing a hook and eye couldn’t fix. Now, version 1 is supposed to sit above the knee and have a deep hem. I was all set for that, thinking a shorter skirt with tights would be perfect for winter. Then of course I made the skirt in spring. 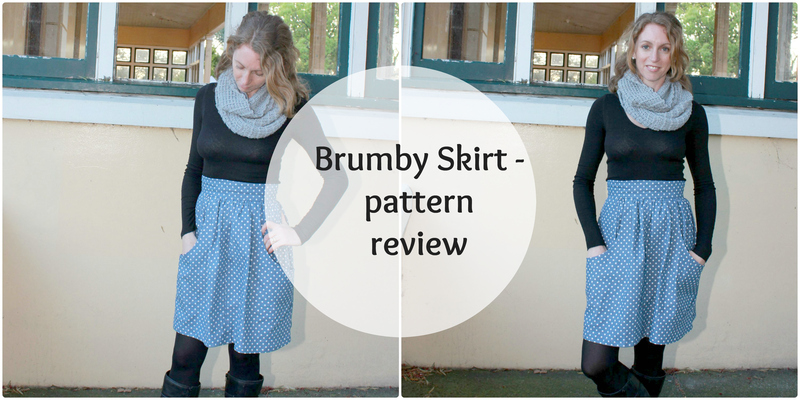 I’m keen to wear my Brumby skirt and can’t wait til next winter. I seem to have a knack for making seasonally inappropriate clothes (remember Alice). I used a much smaller hem which means I’ll be able to wear my brumby skirt in summer too. A short skirt isn’t appropriate when constantly bending over to deal with small kids. I did the world a favour by keeping my skirt a little longer. I made the size small, which is a snug fit on my waist (28 inches). My bust and hips measured an x-small (even a bit less) but my waist was bang on a small. Given the most fitted part of the Brumby Skirt is the waist, I figured that was the best size to go with. When I make my second Brumby Skirt I’ll stick with the small. This was the first time I had sewn with denim. I used a size 90 needle given the heavier weight of the fabric. As denim has a slight stretch I increased the stitch length to accommodate it. Megan is striving to bring sewing into the modern world and has launched an App to accompany her patterns. It’s rather innovative and the best bit is that when you’re fabric shopping you can whip out your phone and the details you need, like fabric amount, zip length and the rest, are literally at your fingertips. 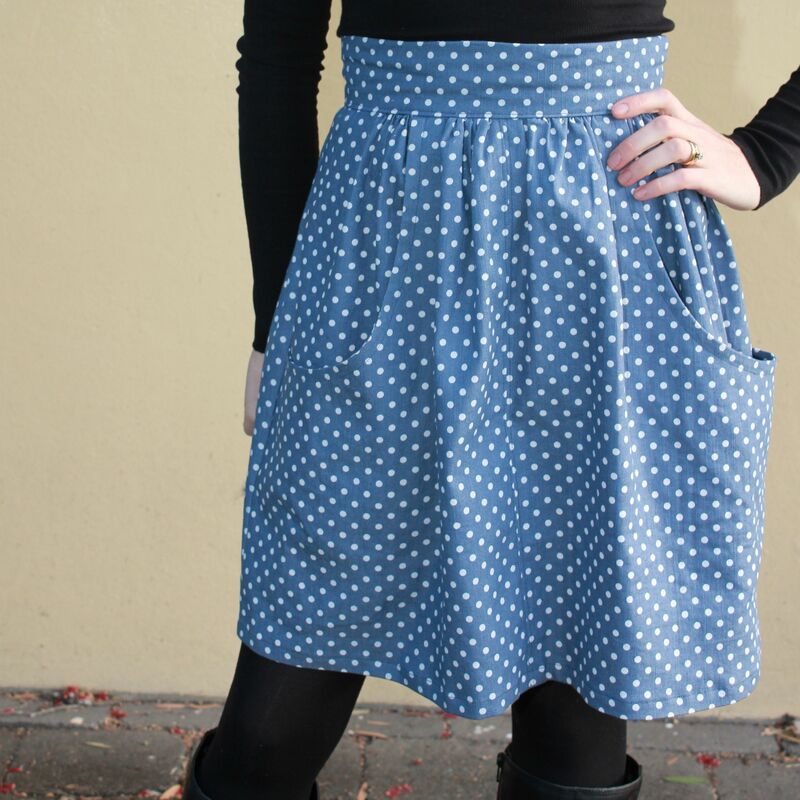 The Brumby Skirt is, as you’d expect, starting to pop up around the internet. Funky Bunny has a lovely pink midi version, Carly has made a version very similar to mine (but shorter) and Amanda has a snazzy dark denim Brumby. 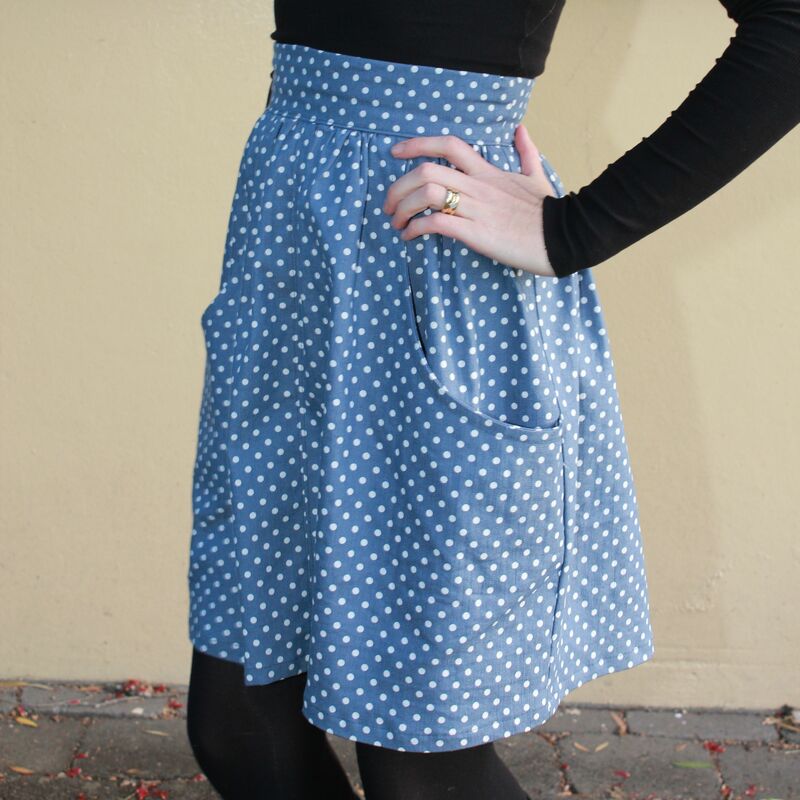 If you fancy a feminine yet practical skirt (pockets people), then the Brumby Skirt is for you! It’s gorgeous Claire! I love your fabric choice. Besides, a skirt with pockets is a wonderful thing. At the moment I’m working on a moneta dress after falling in love with the pockets in that! Oh, a Moneta dress! I’ll have to check it out, happy sewing. Wow! Looks great. I don’t think my body could pull off a skirt with pockets, but it looks awesome on you! Thanks Kelly, honestly try a skirt with pockets, you’ll never look back! Thanks Bron, the practicalities of a skirt with pockets cannot be understated! A seriously cute skirt! Love the pockets. Thanks Rachel, I’m pretty happy with my Brumby! Thanks Allison, being the tall mama that you are you might want to add some length to the Brumby!